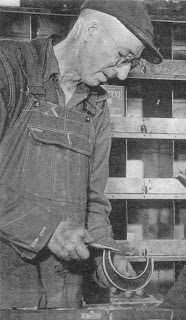 Last week’s subject, iron miner George Davies (1892–1983) of Standish and Lyon Mountain, was a kindly gentleman with a powerful work ethic and a can-do, pioneer spirit. Interviews with him in 1981 were key to my second book, Lyon Mountain: The Tragedy of a Mining Town. Humble and matter of fact, he shared recollections from nearly 80 years earlier. At one time, Lyon Mountain had a large Swedish population [there is still a section of town referred to as Sweden]. 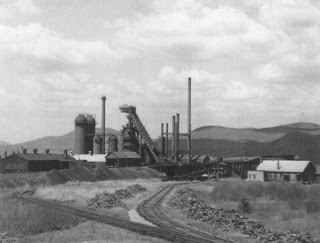 George recalled the great strength and toughness of one of their number who worked at the Standish furnace. “It’s quite a job carrying that pig iron, you know. It [the molten iron] ran down like water, and they had to let it cool, and then throw sand on it. They’d walk on there with wooden shoes with big thick soles and break the iron up with a bar. It’s a pretty hard job, I’ll tell you. “They had a big Swede come here. He weighed about 225 or 230 when he came here. He used to break the iron. 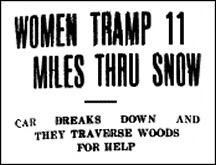 They’d go down to the trestle and throw them over the trestle. They had a V-block down below, and when it hit that, it would break it right in two. They used to wear a hand leather so that the iron wouldn’t cut their hands up. “That big Swede, he had what they call a ‘double pig.’ It was two of them together [130 pounds], and when he went to throw it, it caught in his hand leather and it pulled him right over. He struck headfirst into the pile of iron that was sticking up. Well, I came along there and I picked him out of the iron. ‘Aw,’ he said, ‘I guess I’m not hurt much,’ and he was rubbing his head. “He just had a suit of overalls on and a shirt, and the blood was running out of his pants leg. I said ‘You’re hurt all right,’ and he rubbed the back of his head some more and said ‘I’m not hurt much.’ Well, I took him over to the office and they took him to Plattsburgh, and they found out that his skull was fractured [a story I later verified in newspaper accounts]. “That fellow drank a couple of quarts of liquor a day, and you’d never have known he was drinking. He was about six feet six inches tall. He didn’t die from that accident. He was so strong. They used to load the iron by hand at what they called the wharf. It was piled up like cordwood, you know. He carried 106 tons of iron in one day, and he got six cents a ton for carrying it. “His first name was Nels [Nelson Holt]. He only weighed about one hundred pounds when he died, and he was still carrying iron just before he died. He used to work in the cast house, and I’d see him go down to break a cast of maybe thirty or forty tons, red hot, with sand on it. Sudden violence struck the mines almost on a daily basis. More than 160 miners died in accidents, but hundreds more suffered terrible, often crippling, injuries. Much of it was connected to workers’ ignorance of the dangers at hand. “Well, you know, those Polish people came here and they didn’t know what the mines were in the first place. I remember one time, they used to put the powder [dynamite] together with the caps up on top and then send it down. They weren’t supposed to do it, but they did it anyhow. One fellow saw the stick of dynamite there. He held the stick in his hand and lit the fuse. Well, he didn’t have to let go of it because when it went off, his hand went with it. It blew half of his hip off at the same time, just because he didn’t know any better. George described another accident that is still recalled by some in the village. “One fellow used to be a foreman, and he used to repair the train cars. One end of a car was all bent, and he wanted to straighten it up, so he said to a worker ‘Get a block, hold it against that spot, and I’ll bump it with the electric motor.’ The guy wouldn’t do it, so he went and got the block, and he got somebody to hold it. He was going to give it a hard bump with the motor. George and many others like him offered hours of candid recollections about life in the mines and in Lyon Mountain village, all of it important to regional history. 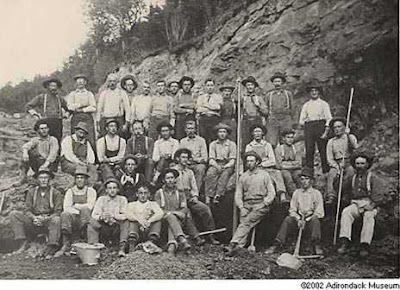 Besides the books (including Out of the Darkness: In Memory of Lyon Mountain’s Iron Men) on the town’s amazing story, more can be learned by visiting the Lyon Mountain Mining &amp- Railroad Museum. Housed in the former railroad depot building, it is operated by volunteers from June to early October. Look for it again in 2013. It’s well worth the trip. Photos: The furnace at Standish (1930s)- rows of pig iron similar to those at Standish (Canadian archives photo taken at Midland, Ontario, 1900).